MIT previously made available it's OpenCourseWare archive which is a collection of lectures, videos, and assignments from thousands of actual MIT classes from the past decade. This content was a valuable look at the type of educational content given from one of the top Universities in the country. The problem was that this was content that had been created with a class room setting in mind. The videos, when included, were hour long lectures of the teacher in a lecture hall, the PowerPoint presentations did not always include the annotation or supporting lecture notes, and there was no interactivity with the class or way to demonstration ones achievements from studying the material. MITx on the other hand, is a firmly immersive interactive experience that has been designed from the ground up to be delivered through your web browser. The program has systems to support automatic grading and feed back of homework and labs. There is a discussion area where students can collaborate by posting questions and answer about the course, and which is moderated by both TA's and fellow students. Each class also has its own wiki, which act as collective class notes for everyone taking the class. Handouts and related readings are linked directly to your course and lecture pages. The lecture videos have also all been filmed specifically for a web audience, and have been given several features to support your learning. Let's take a glance at some of the non-course specific supporting features of the MITx site, and how it differs from OpenCourseWare. The first major difference between MITx and the old OpenCourseWare system is that MITx classes follow a schedule and must be registered for. Homework and Lab assignments are automatically graded but are due at fixed intervals. There is also a proctored mid term and final exam which contribute to the final grade and are used as part of the certification process. I can imagine that previous course content may still be available at other times, but the grading portion of the course only takes place during the 'semester' when the course is active. This first class is scheduled to run 14 weeks, and MIT states that you should expect to spend at least 10 hours a week on this particular course, including the readings and assignments. As of the very first day of class, the first two weeks of the semester are already available if a student wishes to go off ahead. Each week consist of two lecture sections, recommended reading, and both a homework and lab assignment which are both due on Friday of the following week. Students are encouraged to collaborate on lecture exercise problems and to ask questions about the assigned homework. However registration for the course also involves agreeing to a code of honor which states that you should never post results to the homework problems on the discussion boards or copy another students answers. There is a Midterm that takes place on week 8 of the course, and a Final at the end. For the purpose of this prototype course, both of these exams are being given free of charge and can be completed on the your personal computer. Once the system is established however, students will be required to go to a proctoring station and pay a free in order to certify the grading results of the course. Students are NOT allowed to discus the questions or answers in the exam, though the exams are open note. While we are talking about certification, I should mention how they are handling grading for the course. A students final grade is made up from homework (15%), labs (15%), the midterm (30%), and the final (40%). While individual courses may differ, for this course they are using a simple A, B, C grading system system where an A is anything above a 87%, a B is above 70%, and a C is above 60%. Completing the course with one of these grades will result in receiving a certificate with your name and grade printed on it, as proof of course completion. There are 12 total homework and labs for this course, but only the top 10 scores count. Though the system has gone through some iterations, currently you can check to see if your answers are correct as many times as you like before the work is automatically submitted at the deadline. The exams will eventually need to be completed at locations that agree to do proctoring, to ensure that no cheating occurs. These locations are not MIT specific, and generally are places that offer proctoring services for all kinds of other testing. There will be a fee associated with the exams, most likely to discourage people from repeatedly taking the exams until they pass. When a student does get a passing grade in an MITx course they will receive a certification/degree from MITx, not MIT. If at anytime you want to drop the class, you can opt to make the course 'non record' at which point your grade will no longer be recorded with your profile, but you are also then ineligible for certification. 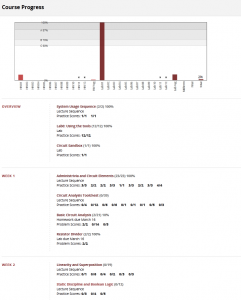 Students can view their current progress in the course at any time, through their profile. 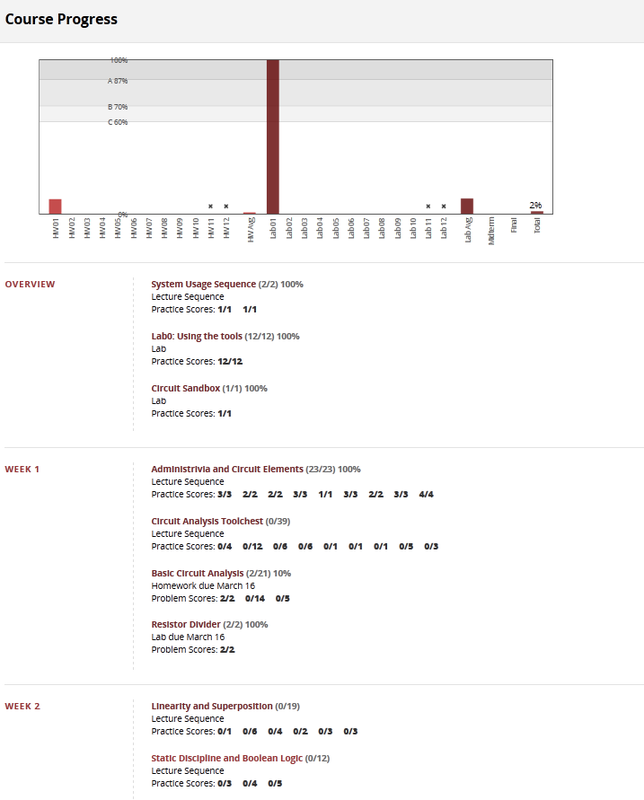 The profile not only shows a bar graph of all of the graded content, it also outlines each week of the course and marks your percent completion from watching the lectures and doing the class exercises as well. All of the graded material is scored in real time the second you submit your answers, so you can always know where you stand in the class. In addition to the videos, there are also a number of 'handouts', which are text or pdf based instructions elaborating on the site and course related content. There are also a number of faqs, the course wiki, and discussion forum as well; so there is no shortage of information on how to deal with the new platform they are creating. In order to participate in a course, you must register for an account using the typical registration process. Once you log into your course, the very first page you are presented with in the website acts as the home page for your course. The front section contains updates and information pertinent in the course and pointing you to which readings or videos you may be interested in for that week. The right hand side of the page contains a link of handouts which contain various information, including the course syllabus and the course calender which lays out the structure for the course. 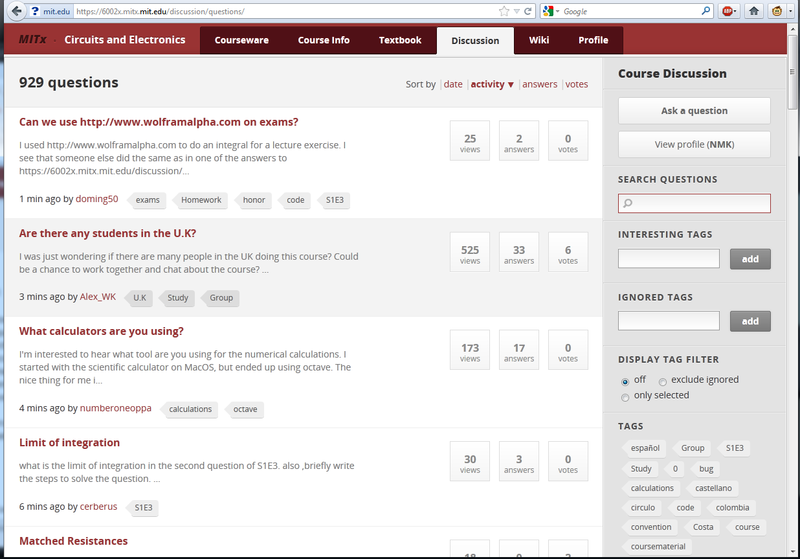 The course discussion page is a place where students can post questions or threads about the class. This board is moderated by the Professors and TA's of the course, as well as other students. The question format works using a vote up/down system which allow popular answers to rise to the top. 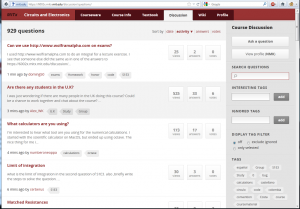 Students are also given a karma system, where participation in the forums gives students increasing ability to moderate the forums. There is a requirement of at least 15 karma before you can down rank any post, so some attention was given to reduce trolling. All of the questions can be sorted by date, recent activity, or popularity. There is also a search function on the right hand side which is actually quite useful. All of the content delivered in the course, whether lecture, exercise, or homework is indexed with a code, such as S1V12 (Seminar 1, video 12). So if a student wants to ask about a specific problem or concept, it is really easy to reference it or search for existing questions about that content. 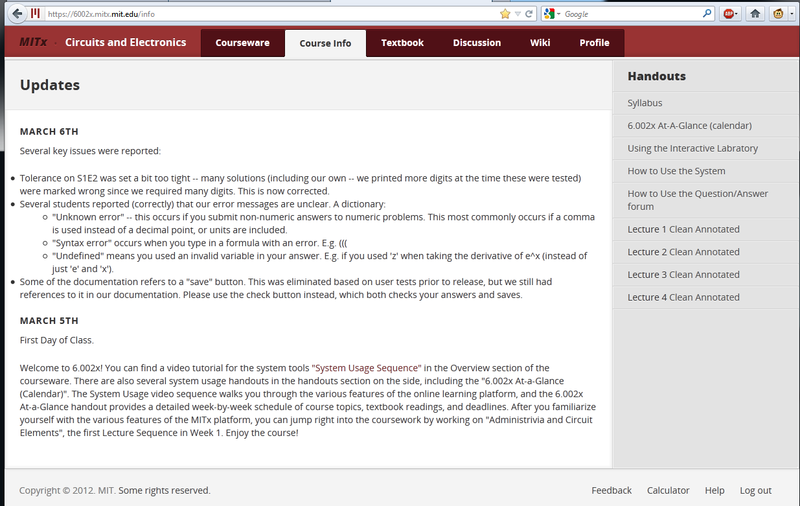 The course wiki acts as a repository for collective class notes on the entire course. Students can combine their own individual notes about specific video lectures here. You can also create pages for specific concepts or laws related to the class, such as detailing the math or explanation behind a specific equation. One of the really neat features of this wiki is the ability to integrate the circuit labs right into the wiki page. A student can define and build a specific circuit, save it to the wiki, and then reuse that circuit on any page in order to demonstrate a principle. 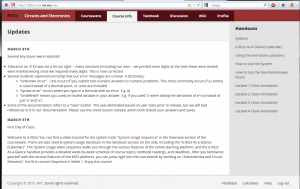 The wiki also contains a means to write out complex math equations using the MathJax library. This allows certain symbols and concepts such as integrals to be represented on the pages more easily and without the need of images. The wiki also contains other articles such as various Faqs or instructions on how to use the site, a bug list or feature request for the course and system, and references to outside material. Between the discussion and wiki, all of the 100,000 students taking the class at this time can help contribute and support each other during the semester. In part two of my review, I'll take a look in detail at the Courseware section, where the majority of the course content is delivered. Or skip ahead to part three where I give my cometary on the course from a students perspective.